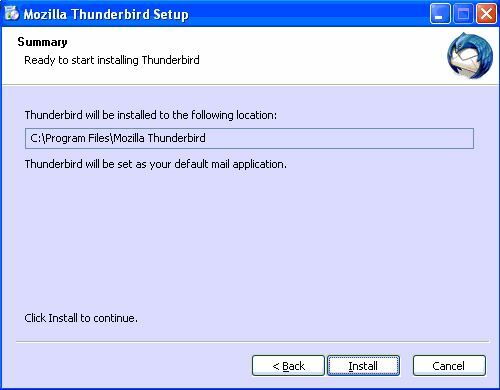 If you see the error “We’re sorry Thunderbird had a problem and has crashed”, all is not lost. I’ll take you through some fault-finding stages that may help. Yikes, not great information there and submitting information to Mozilla doesn’t help you in the short term, although it helps them to develop the software better. Close all open programs and run the tool. Create a backup accepting all the default options (this backs up everything). Now we are going to run the installation program and install it to the exact same location your existing one is in. Note, we are not uninstalling the existing version. If you are not sure of the location, accept the defaults. The installation program will not tell you it has detected an existing version but that’s OK.
For reference, I have done this countless times and the last was overwriting a version 8 with version 9. If you are running a really old version then there may be a compatibility issue but I haven’t found anything that version 9 can’t successfully overwrite yet. 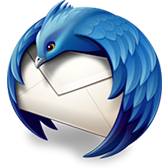 Now we can start Thunderbird. It may prompt to update plugins which you can accept or disable those you don’t use. You should find your data exactly as you had before. In my experience, you only need to fill in your SMTP server details (if at all). If you have anything missing you can run MozBackup to reinstate it. Install any plugins or add-ons that aren’t there that you previously had such as Spam filtering (via an Internet Security package or other such as SpamFighter etc). 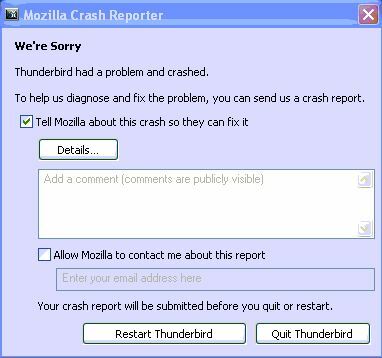 Job’s a good’un and you should now have a fully functioning Mozilla Thunderbird without the “We’re sorry Thunderbird had a problem and has crashed” window! Advanced, Beginners, Email, Intermediate. permalink.